This is the 11th year of me working in the Design industry. I started as a freelance graphic designer working on contracts with startup businesses, and later on as an in-house web designer/web developer, and the owner of an online magazine that publishes design-related content. Throughout this stint, I’ve met and I’ve learned from designers much better than me at this craft we call Design. I’d like talk about some of the things I’ve noticed about them. Do you see the following signs that you should be a designer in yourself? Have you ever gone to the grocery store and thought to yourself somewhere along the lines of this: I wonder what font this can of tuna is using. It could’ve communicated better to me if it had a bit more kerning. Designers know that they’re surrounded by Design, and they just can’t stop their minds from unearthing lessons, ideas, and solutions through the things they see and experience. Designers will see Design outside of their own interests; outside of websites and user interfaces if they’re a web designer, outside of business cards and letterheads if they’re a print designer, outside of furniture and wallpapers if they’re an interior designer. I catch myself studying Design in things other people don’t think is possible. 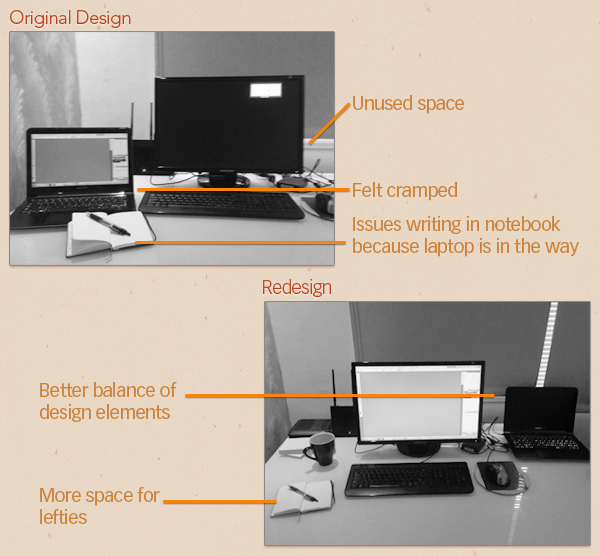 For example, I’ll instinctively see how I’ve designed my workstation inefficiently. How my workstation would serve me better if I moved my laptop to the right side of my table, which would then open up some space for handwriting on the left side, which is better because I’m left-handed, and because doing so wouldn’t affect access to the electric wall socket that I need to power the laptop, and because I don’t have to spend any time rerouting any of my workstation’s wiring. I see Design while I’m in my car driving down on a highway and I spot a road sign that could improve its service to motorists if it were positioned or angled in a different way. I see Design in the innovative way a mobile app deals with a tricky user flow on a small screen. Design is everywhere and in every thing, and designers have the tendency to look at it instinctively. Being a designer means you care about the details. But let me rephrase that. More than just being detail-oriented, being a designer involves identifying the details matter, and giving them the care and attention they deserve. Details that affect people’s experiences with our designs matter a lot. These details are sacred. So we’ll worry and debate about the huge impact that 3 pixels make on readability and usability, but not when it’s simply a matter of subjective or stylistic taste. The ability to parse what’s important and what’s not is the difference between a very productive designer, and one who doesn’t produce anything because he fears imperfection, and other inconsequential things. I can boil down the singular goal of Design to this: Designing some thing means to make it better than if you were to leave it alone. A design is successful when it properly provides solutions to real problems. It’s in redesigning a website so that people can find their way around it. It’s in coming up with clever data visualization solutions to include in your infographics so that people can easily digest the numbers. And so it only makes sense that a successful designer, by default, is a problem solver. And more than that, a great designer is compassionate, and looks at the needs of other people first. A designer recognizes the fact that creating the perfect design according to their own perspective and style will fail if others don’t think the same way. Sometimes I go overboard with problem-solving, to the point where it becomes abrasive, (I’m working on this though). I always find myself framing things in terms of Problem -> Solution. And when a friend just wants to vent and an ear that will listen, trying to offer solutions isn’t really the solution. I told you that to illustrate this: This trait — the desire to help and solve problems — isn’t because of some sort of obligation to the profession of Design, or some feeling that it’s my calling in life, or anything sophisticated and philosophical like that. This trait’s just a part of my character. Do you constantly find yourself looking at something and filling in the blank in this phrase: "This could be better if [blank]"? Are you the type of person that refuses to believe that "good enough" is good enough? Do you always look for ways to rise above the current situation, and find innovative ways to solve problems? Great designers constantly search for new ways to innovate and make things better than they are. We’re not afraid to redo our grid layout if it results in better visual weight composition that draws attention to certain areas more effectively, or to iterate on and release a new version of our UI, because we’re constantly looking for opportunities to provide solutions to real problems that make things better for the people that we serve. Designers spend a good amount of time learning new things. New Photoshop tricks. New ways to design websites. Or better ways to market their design business. Designers don’t like it when they become complacent because they know this leads to bad designs. Designers need to communicate effectively. I’m naturally an introvert with poor communication skills, and when I was younger, I was an extremely shy person. So I’ve had to learn this lesson the hard way. I learned it through not being able to close design projects. I learned it through not being able to get my ideas implemented in my own designs, defaulting to whatever harebrained idea the client wanted because I didn’t have the tools to back up my arguments. I learned it through having a difficult time working with other designers and developers. But what’s important to note from what I’ve seen in my experience is that I desired to become better at my weakness. I thought to myself, "I need to be better at this, so that I can be a better designer." I’ve read many books, articles, scientific studies, anything I could get my hands on that would have even a slight hint that it could help me with better communication and interpersonal skills. I’ve begged for one-on-one time and meetings over coffee from people who I believed were effective communicators so I could learn their secrets, and to get their opinions on how I can improve my own abilities. These conversations would lead to important lessons and tips like "Read [this book]" or "Join Toastmasters, I think they meet every Wednesday at 8 at that coffee shop on Union St." or "Just be yourself and be honest." My communication skill is still a WIP, I have a long way to go, but I’ve already reaped the benefits of my progress. I’m much more able to communicate my ideas well. I’m much more able to work collaboratively with other designers. Design is communication of information and ideas through a visual medium — it would make sense that it’d be hard to be good at it without having the other half of the equation. The most critical thing I’d like you to take away from my own experience is this: Your communication abilities, just like your Photoshop skills, can be learned and improved if you want it to. Designers are very passionate. A designer can be extremely focused in his design work that he’ll often not realize that he’s already spent a good portion of the day just picking the right font or hue of red. When I designed the layout of this website I wanted so much to get it done so Isaac and I could launch Design Instruct that I forgot to eat. I forgot to eat for 30 hours. Yup, that’s right. I forgot to eat and sleep. Aren’t those fundamental needs of all human beings? I sat in front of my computer from 6am to 12pm… the following day. I already knew at that time that doing that wasn’t good for me — for my health, for my productivity, for my ability to avoid burnouts — but against all logical reasons, it happened anyways. That just goes to show how extremely focused we can be with our work sometimes. Productive designers, on the other hand, are able to take control of their time by only focusing on the details that matter, and on solving problems that matter. I could have accomplished the same exact things without forgoing food and sleep if I was smart with my time, and if I had worked on the right things. A good designer is purposeful in her work, and she’s results-driven. She can’t afford to spend the entire day choosing between Avenir or Vectora (by the way, if you’re in this situation right now, these are two very good fonts and I’d also have a tough time deciding which one to pick). If you have a tough time taking control of your time effectively, just like communication, you can improve it. Quite obviously, you’ll need to be creative to be a good designer. You have to be resourceful, you have to be able to look at and see things in ways that may not be as readily apparent to your peers. But you already probably knew that, and you’ve read so many articles about the importance of creativity in many other places that I have very little more to add to that. So I’ve just put this one here for the sake of completeness. If you’re not a designer yet and you see many or all of the signs pointing you towards your destined career path, don’t let this moment pass. You already have two important things that make designers good at what they do: The desire to be one, and the interest to learn how to. Which is probably why you’re reading this article this far. Sign up for an online course at Treehouse, Train Simple, Code School, etc. If you’re already a designer I’d like to ask two things from you. First, share your own thoughts and experiences in the comments below about the things I’ve talked about in this article so that other readers after you will get to this article in a much better, and more enriched state. Secondly, keep doing what you’re doing now: Designing awesome things. I know this profession can be rough sometimes but I want you to remember that you serve a great purpose in this world.